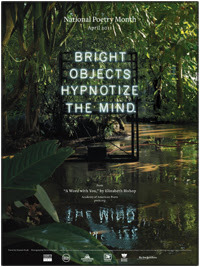 The Books for Walls Project: National Poetry Month 2011: What is National Poetry Month? And Poetry Books for Everyone! National Poetry Month 2011: What is National Poetry Month? And Poetry Books for Everyone! "National Poetry Month (NMP) is a month-long, national celebration of poetry established by the Academy of American Poets. The concept is to widen the attention of individuals and the media—to the art of poetry, to living poets, to our complex poetic heritage, and to poetry books and journals of wide aesthetic range and concern. We hope to increase the visibility and availability of poetry in popular culture while acknowledging and celebrating poetry’s ability to sustain itself in the many places where it is practiced and appreciated." For more FAQs on NPM, click here. Around here poetry is a part of life --we're not exactly great poets, but the poetry of life surrounds us.The Sisters have always loved poetry --from simple verses when they were young to the works of great masters as they grow. Last year they spent an afternoon with a friend who happens to be a poet and a teacher --she paralleled Emily Dickinson and Gertrude Stein. Sharing each woman's life, their pictures and then their poetry. 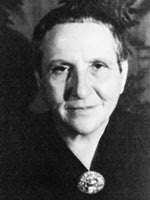 "Gertrude Stein knew PICASSO, she was social and Emily liked her garden, and was quiet!! 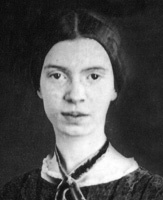 Gertrude's poems are harder to see --but fun-- Emily's are easy to imagine." The Sisterscannot forget the difference between the two and will not forget their poetry. Our friend knew how to pique their curiosity and plant a seed that is flowering into a love of poetry. There are brilliant ways help children (and adults!) learn how wonderful poetry is and how it can help us through every moment of our lives. There is poetry for every person --sometimes it can be hard to find. So we put together some resources and we have a few amazing poets and poetry lovers here at Books for Walls Project, so email us if you have a question or thought about poetry --we'll try to help you find what you need! From The Mom: She Walks in Beauty: A Woman's Journey Through Poems by Caroline Kennedy. I've had this book for less than a week. I have cried, laughed and ordered a copy for each Sister as gifts on their 18th birthday. For more on the book listen to Caroline's interview last week on NPR, click here. Now We are Six by A. A. Milne Fun and silly verses for little ones --a perfect birthday gift for a six year old, to boot! Emily Dickinson Collected Poems The Poet gave me my copy, making it even more special. Four Quartets by T.S. Elliot my little book is so worn and loved, but precious. From The Teacher: Where the Sidewalk Ends by Shel Silverstein; My Dog May Be a Genius by Jack Prelutsky (Children's Poet Laureate) and others of his; Reflections on a Gift of Watermelon Pickle - and other Modern Verse (compilation); Old Possum's Book of Practical Cats by T.S. Eliot; A Child's Garden of Verses by Robert Louis Stevenson; You Read to Me, I'll Read to You and You Know Who by John Ciardi. From The Librarian (we'll be introducing her soon! ): 100 Love Sonnets (Cien Sonetos de Amor) by Pablo Neruda. Good for newlyweds and others needing inspiration. From The Bean: The Enlightened Heart: An Anthology of Sacred Poetry It has selections from world cultures and religious traditions. A Light in the Attic by Shel Silverstein. From The Big Sister: All the poetry I like is from all different books, some aren't even in books, I think I need to start my own collection! I really like Robert Frost! But we do LOVE this collection by Caroline Kennedy A Family of Poems with paintings by Jon J. Muth --poetry for the whole family, a perfect gift for a baby, a child, for anyone who loves poetry! Tips for teaching poetry from The American Academy of Poets, click here. The Mom's favorite daily dose of poetry: The Writer's Almanac, click here and sign up for a bit of inspiration every single day! How about some Spoken Word Poetry? Watch Sara Kay's TED talk and learn about Project V.O.I.C.E., click here. The Sisters are working on funding to bring Sara and Project V.O.I.C.E to Northern Michigan, if you are interested in getting involved, email us! Explore local poetry, learn about poets in your own backyard, click here for an interactive map from The American Academy of Poets. Learn about Poetry Out Loud: National Recitation Contest "encourages high school students to memorize and perform great poems. Poetry Out Loud invites the dynamic aspects of slam poetry, spoken word, and theater into the English class." Click here to learn about this years contest. Poetry Everywhere was created "to expose a diverse audience to a broad spectrum of poetic voices, build an appreciation and an audience for poetry, and increase the presence of poets and poetry within the two most ubiquitous media in American popular culture–the Web and TV." We simply think that Poetry Everywhere is lovely, lovely, lovely -where else can you watch animated poetry shorts and Robert Frost reading Stopping by Woods on a Snowy Evening? Please click here to enjoy Poetry Everywhere!! Visit The Poetry Society of America, "The Poetry Society of America, the nation's oldest poetry organization, was founded in 1910 for the purpose of creating a public forum for the advancement, enjoyment, and understanding of poetry." click here to visit their comprehensive website. Please feel free to share your favorite books of poetry and if you are in the mood, take a poetry challenge: Haiku Your Book Challenge, Put a Poem in Your Pocket Challenge, Your Reading Life in Six Words Challenge, Poetry in a Vacation Challenge or come by tomorrow for a new Challenge, this week from The Teacher! We have been reading a lot of nursery rhymes, and love Robert Louis Stevenson too. Fyn's current favorite is "Truckery Rhymes" which we found at the library in TC. Perfect for a three year old. He's even starting to recite them, it's hilarious! I listed some books of poetry that I thought might appeal to younger readers, as well as older. But as an "older" I would always want to keep a copy of THE PROPHET by Kahlil Gibran within reaching distance. Add that to the list, please.